Since retiring from competition, Finnish ex-rally driver Kari Mäkelä has been busy building badass Michelotto rally-car replicas out of classic Ferrari 308s. Let's take a look at what goes into a typical build. Strap in; you may be here a while. Mäkelä Auto Tuning's state-of-the-art shop is set up specifically for this kind of high-end work. 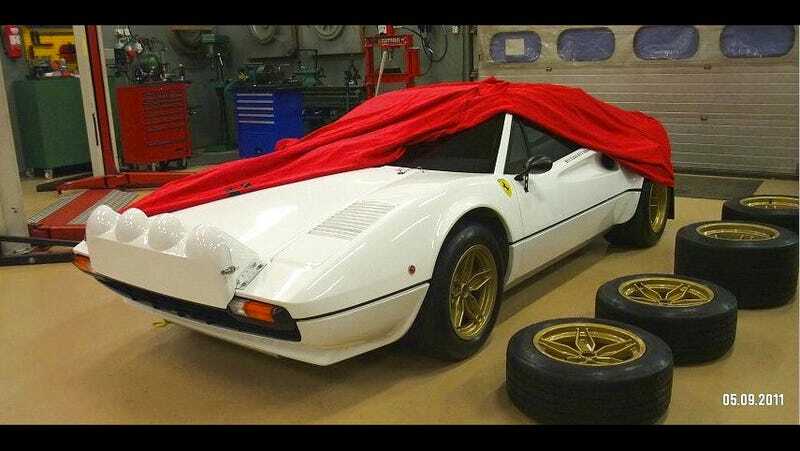 In this case, he's taking a standard 1976 Ferrari 308 GTB and turning it into a replica of one of the most awesome, if not storied, racing machines of the Me Decade. The Michelotto Group B rally cars circa 1983. It's not an easy job. Mäkelä and staff have to strip the 308 to the carcass, prep the frame, and then re-assemble a full cage; a new, racing-minimalist's driver's compartment, and all-new suspension gear. Naturally, a stock Ferrari can't do dirt stages any more than Carla Bruni can compete in an Olympic deadlift competition, and so a new suspension — an elaborate puzzle of coils and dampers — is a must. But, you know, these guys do it all the time, so they kind of get it. Also, since this car will see action in historic rallying, it has to comply with most original FIA homologation rules (some updates are allowed for historic racing), and do everything the original racecars once did for real. It's probably cost effective too, considering one of the original Michelotto cars sold earlier this year at a Bonhams auction for 460,000 Euros. And so it is: 20 months and 7,000 man-hours later, we've got a Ferrari that's nearly identical to the cars that ran in the '83 Group B season. Thankfully for build-thread nerds, MAT documented the build with 2344 photos and a video. That should be enough to get the gist. One nerdy note. As you can see from the photos, MAT's replicas have carbs, not the Bosch K-Jetronic fuel-injection of the true Michelotto race cars (not that we're complaining). But from the looks of that sticker from the race tech inspector, it's apparently just fine with him. And listen to that engine note, and believe me. All will be forgiven.